At the beginning of summer my daughters, Blessing and Hope, captured a caterpillar and put him in a jar. With a little help from me they filled the jar with sticks and leaves, added a little dish for water, poked holes in a tin foil lid, and placed it in the sun. For weeks we watched him closely. Our little friend, Fuzzy, seemed content to crawl around and munch on leaves. Chomp! Chomp! Chomp! He’d munch his way through a jar full, and we’d clean it out and fill it up with more. The desired result was obvious, Blessing and Hope couldn’t wait to see this wormy little guy transform into a butterfly before their very eyes. However, a quick Google search led us to believe that our caterpillar was actually on his way to becoming a moth instead. No matter, with a little more research we found that he especially liked milkweed and stocked his jar accordingly. What research didn’t tell us was how much and how quickly milkweed leaves turn to fuzzy grey mold. Seemingly overnight Fuzzy started his cocooning phase as our milkweed started to rot. So there we had it, in a few days time, a jar full of mold and one cocoon hanging by a silver thread. Fuzzy’s future did not look bright. Where there is no way He makes a way. Squeals of delight filled our house as we saw what she held in her hand: A tiny moth, freshly hatched, flapping its shriveled wings. A living thing. A new creation. Here we are at the end of summer. It’s been months since I’ve come to this blog in part because this past season, hasn’t differed too greatly from Fuzzy’s time in our jar. 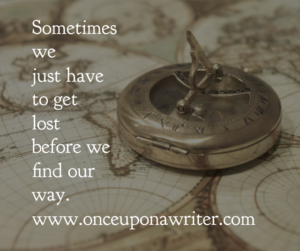 Not long after my last post, a post where my hopes were high for diving into my writing…getting lost…as I called it, I derailed into a different sort of lost-ness. Wounds and hurt and sins from my past, I thought long dealt with and buried, resurfaced with a nasty, rotting vengeance. 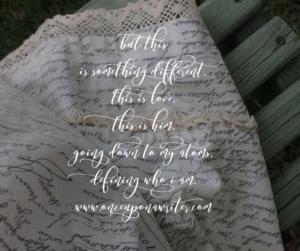 My relationship with Mister Wonderful, my dreams for writing, my desire to homeschool, even my hope for our family business and our home building project, seemed to dangle by a thread. I realized it one morning in May. I needed help. I needed healing. I needed a cocoon wrapped around me. Love pulled tight. A miracle worked on the inside. For the first time in my life I sought and found the help I needed in the form of a Christian counselor willing and able to take on my yuck and decay. Lovingly, wisely, she tended my leaves through this summer season, stocking my jar with good things to chew on. Every few weeks I was fed. Truth. Love. Possibilities. A little more, a little more, until at last it started to happen, that wrapped up feeling I longed for. That wound up tight, impossibly fragile yet impossibly safe place of not just knowing I am healed, forgiven, loved but also feeling it. Experiencing it. The reality of the cocoon. To emerge a living thing. A beautiful thing. To stretch my wings and enter into life and all He has for me, a new creation. 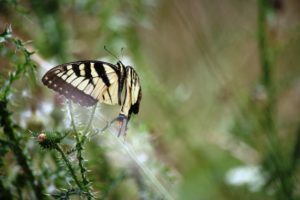 A friend once told me that when a caterpillar goes into its cocoon it is physically broken down to its very atoms and is from there rebuilt, remade, transformed into a butterfly. As a Christian I’ve always known in my head that God loves me and, yes, there have been countless times when I felt His love in my life. But this is something different. This is love, this is Him, going down to my atoms, defining who I am. And this defining, redefines everything. My identity, my marriage, my desires, my hopes, my dreams. This feeling, this awareness would have been enough for me, but the Author is writing a fairy tale and nothing short of happily ever after would do. Fresh out of the cocoon He gave me a storybook opportunity to spread my crumpled wings and fly. 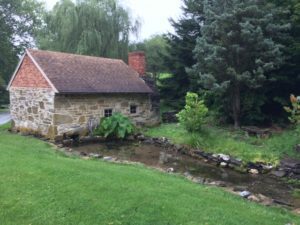 At a bed & breakfast called Stoneycreek Farms in Boonsboro, MD (an old 1800’s farmhouse refurbished into an inn) my three best writer friends and I met for a week of beauty, rest, and writing. We’re talking my own king size bed, my own fancy bathroom, hours and hours of writing time, dinner and laughter and movies each night with kindred spirit friends, long talks, walks down flowery paths and creek side trails, porch swing reading, soaking in the love of God for one whole week. It was like one long, passionate kiss from my Savior. How so very like Him. To call out my heart from the deep, from the almost discarded, and supply me with more than I need, with more than I could dream of or think to ask for. To fuel the burning dream inside me. To awaken me to all things good, to His love and care for me. While at the inn, as we now call it, we saw them just about everywhere. Unfurling all kinds of magic and beauty, they fluttered all around us. My friend Bethany spotted one in particular, a swallowtail perched on a flower, and captured him with her camera. “He was missing one of his tails,” she told me as she described her amazing find. A chance to break free. Worms transformed with love and the magic of butterfly wings. A few weeks ago during the NCAA basketball tournament I watched a post-game interview with North Carolina’s coach, Roy Williams, and his star ball-handler, Joel Berry. The game had been pretty harry. 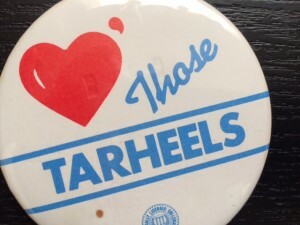 As a huge fan of North Carolina I watched with my hands over my eyes, peeking between my fingers, as my Tar Heels almost gave the game away to Arkansas in the second round. “Joel, how did you manage to take control of the game at the end of the second half when Arkansas had your team against the ropes?” the reporter asked. When I heard this I loved it! And I claimed these words as my own. For weeks I’ve been caught up and a little bit lost in hundreds of decisions concerning the home building project Mr. Wonderful and I started this January. Flooring, faucets, paint colors, lights, appliances, trim… the list of details seems endless. And while I have loved every minute of this long awaited process my writing has been put on hold until this part of the project is finished. Now, with our list of selections turned into our builder I’m free to start writing again but I’m struggling to find my bearings. 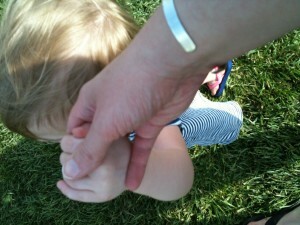 It’s been weeks since I’ve blogged or worked on my story and it’s hard to know where to start. I’m excited and scared and nervous and why does it seem like the first steps are always the hardest? And again, the words of Coach Williams ring in my mind and my heart. Becoming more than just the words of a beloved coach, they’ve adopted the voice of King Jesus. When I was growing up I took years and years of piano lessons. I loved the music and the notes and played my favorites, Canon in D and Fur Elise, over and over again. The times that were the sweetest were the moments when I got lost in the music. While my fingers kept playing notes…notes that had become an extension of me…my mind wandered far away and the music somehow kept flowing. Without even thinking about what I was doing the music turned into magic, a spell of my own creation. Moments like these never ceased to amaze me and it was for moments like these that I kept trying, and failing, and learning, and playing. Now writing is the magic I covet, and as I look to dive back into to my world of words and stories I know the only real way to do it successfully is to let myself get lost. In music, in writing, in life. In all things good and noble and worth the doing. Sometimes we just have to get lost before we find our way. Last weekend while driving the twists and turns of Michigan country roads I found my mind drifting away to another place and time. The weather was warm and bright, a treat for mid January, and the soft crooning of James Taylor filled our mini van. The combination did me in and before I knew it I was gone, gone, gone, Gone to Carolina in My Mind. The blue sky and warm sunshine, the music, it all took me back to my days in North Carolina and all the people I love there. An ache lodged in my heart. Everything in me wanted to turn back the clock, hit the road, head south. It’s a rather disruptive feeling, these aches that appear in the midst of an otherwise contented spirit. I love my life here in Michigan. I wouldn’t trade it for all the sunny south, but there are times like these when I miss that place…when I miss those people so much it hurts. I mean, really and truly and physically hurts. It takes my breath away. When this happens there’s always an intense temptation to avoid the ache, to avoid the hurt. When I’m cooking supper, I love to set my playlist on shuffle and let my mind wander as noodles boil and beef sizzles in the skillet. Inevitably a song will play that triggers some forgotten ache. Alan Jackson’s Remember When makes me miss my Uncle John. Passion’s Oceans makes me pine to relive the day my little Promise was born. Elizabeth Mitchell’s You are My Sunshine makes me remember, all too clearly, how fast these days of tiny feet dancing through the house will be nothing but a memory. When the first notes of these songs trickle into the room my impulse is to hit skip, to not let my heart go there, to avoid feeling the ache. And sometimes that’s ok. Sometimes, for whatever reason, it’s ok to go numb, but I’m learning there are other times when it’s good and right and needed to allow my heart to feel. God created me to be a deeply emotional being, and He also created me to bring those emotions to Him, to use them as a vessel through which He can work. When triggers like these arise in smells, music, pictures, memories, in tiny details that fill our lives we always have a choice. Allow our hearts to feel whatever they long to feel and take those feelings to God allowing Him to show us what He’s after or block our hearts from pain, from His work, from transformation and healing. What I experienced this weekend, in my longing for North Carolina is a beautiful reminder to me to resist the urge to block my heart from pain and consequently from Him. And yes, it’s confusing, yes it’s disruptive, yes it’s painful and hard. But it’s also an invitation. An invitation from the King of my heart to draw closer to Him, to let Him do something beautiful and sustaining in me. How else do we get through life intact than by aching and feeling and opening to Him? And what are these aches and desires really but a longing for Him and His Kingdom? My heart may ache for Carolina, for the faces of family and friends. But on a deeper level I’m also yearning for Him, for His beauty, for relationship, for a time and a place when there will be no more good-byes. I’m aching for my King and His kingdom. I’m aching for His work in me. Dear ones, when an ache crops up in your heart don’t ignore it. 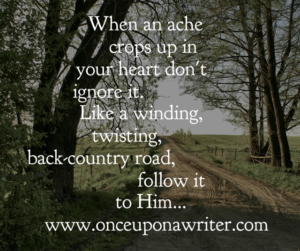 Like a winding, twisting, back-country road, follow it to Him. I’m in the mood for a fight. I have a bone to pick with this crazy, frantic, world and also with myself. There’s this phrase I’m sick of hearing, sick of saying, sick of living. It’s an excuse we all accept and no one seems to question and perhaps that’s because it’s sort of, kind of, true. That there’s just no time for God. Think about it. How many times just this week, just today, have you thought it? Felt it? Said it? How many times have these words been spoken to you? But is it really? Held up to God’s standard is it really acceptable? Is it really easier? Is it really true? Last summer my sweet friend from North Carolina called to see how I was doing. She had news to share. She wanted to talk, to celebrate life with me. It took me two (TWO!) months to call her back. And that Bible, that prayer life, I mentioned before? Yeah, it’s mine. And I know with the friend, with the Bible, with the prayer…if I really wanted too…if I were willing to make them a priority…if I were willing to say, “You know what? You mean more to me than Survivor, more than the next chapter of that page turner I’m reading, more than an hour of sleep here, or 20 minutes on Facebook there,” I could pick up the phone and make the call. I could open my Bible. I could journal my prayers. Because the truth is, I have the time. I have a place in my life. I have space for each of these things. I just haven’t been willing. I’ve chosen something else. I’ve chosen other things. I’ve chosen to put lesser things before people, relationships, God. And isn’t it a little bit like building up an idol? Doesn’t it look a little bit like bowing down to calves? Haven’t we allowed ourselves to get caught up in a lie? “I know, I want that too,” came His gentle reply. Caught in the act that hurt me so deeply, I saw it, how deeply I hurt Him. When I don’t have time for His people, His callings, His Word. When I don’t make time to sit and still and be with Him. How I lie to Him, keep Him waiting. How day after day I put lesser things before Him. How very much it hurts. It sounds cliche, I know. Like the Sunday school answer we’ve all grown up with, but in that moment I didn’t want to waste another minute of precious time. Time I could be spending with my precious, Lord. I grabbed my Bible, my journal, and a cup of steaming coffee. In the midst of my morning, in the messy, mangled, middle of kids arguing, baby fussing, of husband getting out the door, I sat at our kitchen table and created time for Him. A place. A space. An altar just for Him. The truth is we’re all busy. But who among us is too busy? 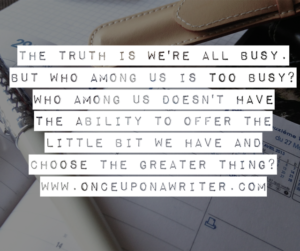 Who among us doesn’t have the ability to offer the little bit we have and choose the greater thing? But what will you do with yours? When I lasted posted on this blog, Christmas carols were still playing, lights were still hung on trees, and hope filled my heart for a fantastic start to the coming New Year. They each beckoned to me with the promise of a fresh start, a new year. New Year’s Day came and went. So far, so good! January 2nd, my best friend, Beth, arrived for her yearly visit from China. January 4th, my new niece was born. We were off to a smashing start. And then January 5th happened. Blessing started to cough. Promise came down with a fever, Hope with a runny nose. It’s okay, I thought. Nothing a little Elderberry and a day or two on the couch can’t cure. 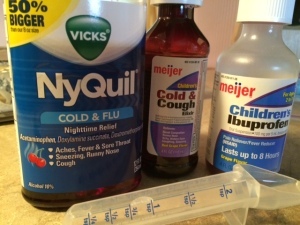 What started as a cold for my girls, turned into colds for Mr. Wonderful and me too, and a long cycle of sickness ensued. As soon as one of us got well, someone else came down with something new. Nearly six weeks later we’re still recovering. And those goals for my new year? Those beautiful visions of getting ahead? Of getting on track? Off getting things done? They feel long ago and far away, forgotten. It’s hard to even remember what they were. Wherever they are, whatever they were as I get myself, my family, my home back together, back to health and life as usual there are three things I’m trying to hold onto. Hoping that if I cling to these above all else, somehow, eventually, the pieces will come together and I will have the new year I hope for. 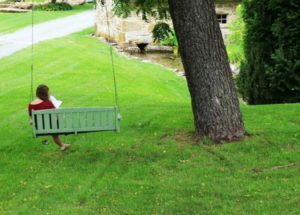 First of all…It’s a slip not a slide: My very wise friend and fellow writer, Cindy Bultema, once spoke about the importance between a slip and a slide. Slips are quick and easy to get over. Slides are long and drawn out. The difference between the two is almost always my attitude and the way I choose to see and react to what life brings. So January and February did not go the way I planned, hoped, or expected. So what! They don’t have to be a slide or, in other words, these past few weeks DO NOT determine the rest of my year. They can be overcome. I can move on. Quick. Easy. A slip not a slide. 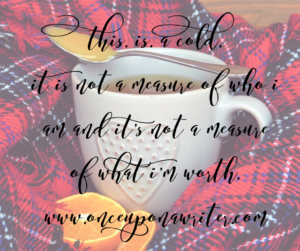 Next there’s this…God’s grace can cover this too: The weeks of sickness my family has experienced is something I can’t control and sometimes recognizing what’s within my control and what isn’t, is half the battle. Rather than fighting against something I can’t control, my limited energy is much better spent doing the things I can do and trusting God with the rest. Because the truth is, His grace really is enough. For all the things that go undone, for all the ways I fall short, He provides what’s needed. Always, just what’s needed. So, yeah, we’ve missed a ton of school days. And, yeah, my writing is on life support, and yeah, these thighs, they ain’t gettin’ smaller… but we’re doing what we can, as we can, and somehow, I trust. I TRUST. It’s all gonna shake out in the wash.
And finally…None of this determines my worth: This is the big one isn’t it? The one we don’t even realize we’re doing to ourselves. The one that sneaks in like a snake and steals every spark of truth we have, every shred of joy, every fiber of peace. When set backs like this happen, when things don’t go the way I planned, it’s so easy for me to go there, to that place where I’m discouraged, where I’m convinced that I’m a failure, where all evidence shows I’m blowing it big time. And once I’m there it’s hard to get back. But the truth? This has nothing to do with me. It. Is. A Cold. A long-lasting, miserable, terrible cold. It is not a reflection of who I am and it’s not a measure of what I’m worth. When I find my identity getting mixed up with what’s going on around me, I know it’s time to start taking captive each and every thought. Inspect every one. Keep the truth: God’s got this. I am loved. It’s going to be okay. We’re going to be okay. His grace is sufficient. I am His and He is mine. Nothing can steal my peace or my joy. Pitch the lie: Ha! You haven’t blogged in a month and you call yourself a writer? How could you? What were you thinking? You are a terrible mother. What a mess you’ve made. What a failure. What a screw up. Whether it’s at the start of a brand new year or anywhere in between, when the stuff of life sets you back, hang on tight to these three things. They may not take the sting away, but they will get you through. Like Elderberry mixed with a day or two on the couch, may they be nourishment, comfort, and the cure for what ails you.